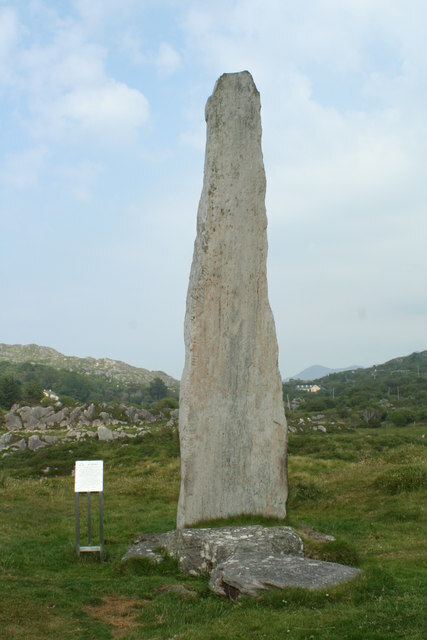 Ballycrovane Ogham Stone is said to be ‘the tallest Ogham stone in Ireland’ and probably in Europe, for that matter. It stands at a very impressive 17 feet (5.3 metres) and is said to be several feet below ground, but it is only a very slender pillar-slab and it tapers slowly away to the top. At the eastern edge there is an Ogham inscription which is becoming difficult to see because of weathering. This stone was obviously erected here during the Bronze-Age, with the notches being carved onto it in more recent times, probably during the 3rd-5th centuries AD. The inscription is now thought to recall someone called Deich and Toranus – the full Latin translation being: MAQI DECCEDDAS AVI TURANIAS which would be ‘Of the son of Deich a descendant of Torainn’, but could the inscription in fact be a kind of dedication or memorial to the Deisi – the ancient tribe that inhabited Ireland – during the 3rd-4th centuries AD? We may never know that question. Ogham was the ancient (Goidelic) language of the Celts who inhabited the western fringes of Britain in pre-Roman times, but it was still being used by the ancient Britons up until the 5th-7th centuries AD – the so-called Dark Ages, at which time many Ogham memorial stones were Christianized with a carved cross. The script consisted of a series of short notches or strokes, carved vertically and also slanting on the edges of grave-covers and some standing stones, similar in fact to the wording and epitaphs that we see on gravestones in churchyards today. Antiquarians and historians in this particular field have now been able to translate, in Latin form, these usually short inscriptions by following the Ogham script alphabet, the key to which was in the 14th century Book of Ballymote. Dictionary of Celtic Mythology, Oxford University Press, New York, 1998. © Copyright Peter Ribbans and licensed for reuse under this Creative Commons Licence. Scherman, Katherine., The Flowering Of Ireland, Victor Gollancz Ltd., London, 1981. Categories: Inscribed Stones, Ogham Inscription | Tags: Ballycrovane Ogham Stone in Co. Cork in Southern Ireland | Permalink.